Morganfield’s® is an award winning casual American diner specializing in pork ribs, namely Sticky Bones®. Our heavyweight hero, is slow smoked and baked for painstaking hours before landing on our griller upon guests’ requests, making it off-the-bone, juicy and tender on the inside, yet a little crunchy on the outside. We’ve easily sold more than 1 million slabs of these oinky sensation since the opening of our first outlet in Pavilion KL 7 years ago and have since build our loyal fan base both nationally and internationally. 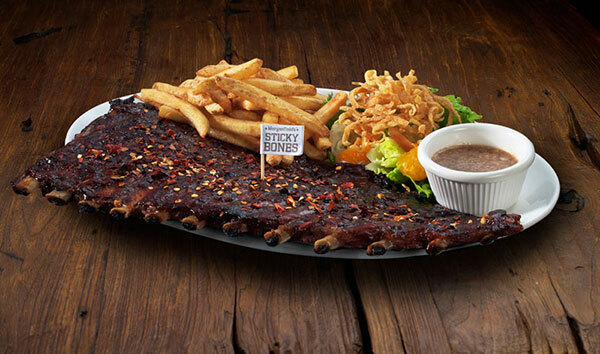 Morganfield’s® is also the pioneers in offering giant platters for those who like to try a bit of this and that. Made for 3 – 4 persons and are share-tisfaction guaranteed, our platters give more value for money and provides more selections of mixed choices. Guests who like boasting their sinful meal are often caught taking pictures and sharing them on social media with these giant platters. Aside from an assortment of porky dishes, Morganfield’s® also serves up a wide array of non porky items with more than 50 one-of-its-kind dishes for guests to indulge in. For those who can’t get enough of Morganfield’s®, they can also opt to bring home some cute and exciting premium items carefully displayed at our outlets.